There’s something so comforting about polenta. Maybe it’s the mushiness. Last night, fighting off a fever, I had an intense craving for this cornmeal goo, so I dragged myself off to the store to rustle up a plate. 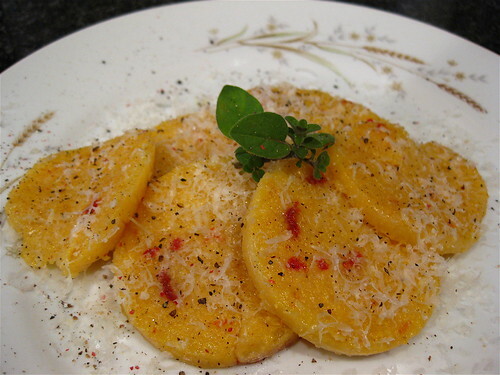 Polenta is one of the staple dishes of Northern Italy, though it also can be found throughout Eastern Europe and Turkey. Honestly, there’s not much to it – boiled cornmeal using either the yellow or white varieties, fine or coarse grained. But it’s a bit labor-intensive. Like risotto, it requires constant stirring as the cornmeal grain’s starch slowly gelatinizes. But once it does – oh happy day. You get a soft, creamy mixture, and that’s before adding any other delicious ingredients like butter or cheese! It’s also extremely economical, filling peasant food that can be prepared in so many ways, from breakfast to dinner. If you see polenta on Italian restaurant menus around DC, chances are it’ll be paired with sausage – this is a pretty traditional mix of mild and spicy. Tosca takes it to another level, matching it with sea urchin ragu and caviar (for lunch!). But polenta doesn’t have to be served straight from the pot – you can also cool it and fry it up. Fried polenta has a more complex flavor than when just boiled – the taste of corn is more pronounced. I was inspired by the grilled polenta I recently tried at Vegetate to make an attempt at this style myself. First off, I was sick, so no way was I going to go through the entire process of cooking the cornmeal, shaping and cooling it, and slicing it up, all before frying it. Oh no. So, a shortcut was necessary. Luckily, you can buy cooked polenta already shaped into a rather unattractive log at grocery stores, usually hanging out in the grains section. I chose one with sun-dried tomatoes and garlic already added in. Unwrap it and carefully slice the polenta so that you have rounds. You need the slices to be a bit thick so they hold the shape. Heat up some olive oil in a non-stick saute or fry pan, and pop ‘em in. Flip as they cook and you’ll notice the polenta taking on an intense yellow color and a maddeningly nutty scent is filling your kitchen. You can fry the rounds until they are just golden, or go a little further until a crispy skin forms, your choice. Then arrange them on a plate, grate some cheese over top (my personal favorite is pecorino romano), season with pepper, and eccola! You have a satisfying meal that is comforting and inexpensive. You could also call polenta what it really is, grits. This is just like calling biscuits “scones,” the gourmet-ification of old school comfort food in an effort to raise its price point. Same as with polenta vs. grits. Both come from ground corn, yes. But it separates out into two parts – the finer cornmeal, and the coarser grits. Polenta is made from the cornmeal, and grits from, well, the grits. The taste and consistency are different. I love grits too but it’s not the same texture. So, yes, there is gourmet-ification of cheap comfort food to raise price points – see offal – but in this case I don’t agree.